These are one of the largest stalactites and stalagmites caves in the country, located in the Ananthagiri hills of the Araku valley. 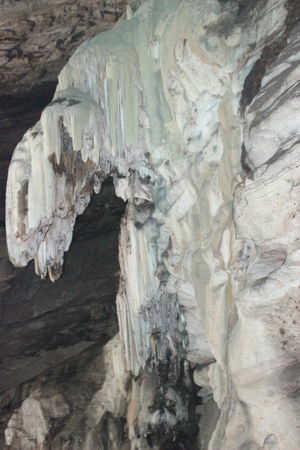 They are considered as one of the deepest caves in India going about 80 mts deep. I could stand there all day, gazing into the distance, admiring the mighty mountains, but we had to rush. We still had a last stop on our itinerary- Borra Caves also called the Borra Guhalu, considered to be the deepest caves in India, situated about 40 km away from Araku. Every picture captured is a wallpaper in itself, lush green mountains, soaring in rain was a treat to watch, nothing is sexier than this view. The route consists of some 30 to 40 railway tunnel and you would admire the efforts taken by the engineers to build this route. We had to get down to Borra Guhalu(Caves) Station as it was some 30 kms from before Araku Valley. Initially I's a bit hesitant about this cave Idea, but, oh boy, that was a massive cave getting deeper and deeper as you go inside creating a sense of fear too with some bats flying here and there. This was a naturally formed cave founded by a british traveller in the 19th century. Sparkled with some fancy lights this place is must visit anyone coming to araku.Now that we had burnt some of our fats, we desperately needed to have something good for lunch, and what better option would be than Bamboo chicken. It's a local tribal way of cooking chicken curry, inside the bamboo. Some might don't like the smoky flavour in it but if you are looking for something different give it a try.For our surprise the organizers of our trip had arranged a tribal Dance for us after the lunch, as initially it was scheduled in the evening, but it was complimentary you can say. Well it was something I saw for the first time and did for the first time as well. The local tribal dhimsa dance is performed in circular motion especially by ladies and instruments played by the men. We tried our part too but failed to match the skills these tribal people had. Day 26Headed straight towards borra caves also there was an initial plan to see araku valley but due to less time settled only for borra caves. It was some 60km from here. And after a 90 minutes ride going through some good hills roads reached borra caves. I removed all my riding gears and kept it inside the top box on the bike. I had my tank bag with me but bags are not allowed inside. But we have a clock room near the entrance where we can keep our bags. Got the tickets and went in. We have to walk some 200 to 300 meters to reach the cave. Once at the entrance i was stunned to see the size of the cave. As i have never seen such a huge cave before. Wonder how did the one who build this ever did this. Slowly i entered inside the cave. It was a massive structure . And the main attraction was the lighting done inside the cave. It was mind blowing piece of work i really have no words to describe the lighting work carried out. One need to visit it to see its beauty. Now it was time to ride back to vijaywada through the same route by which i came here. While riding skipped my lunch so by evening was searching for some place for some snacks could find a proper place. Finally stopped my bike nearby a shop it had only wafer packets, biscuits and cool drink. So initially brought a cool drink and wafer and a biscuit pack after having this i was still hungry as i had skipped my lunch and went again to purchase same things,the lady at the shop looked at me and asked seems you didn&rsquo;t had you lunch. I smiled and said you guessed right. One of apple juice i drank had a manufacturing address of the same place in Mumbai where i belong to wondered i have never seen this drink there. Now i was satisfied as my stomach was full. Came close to vijaywada and halted at a place for a 5 minutes break after sometime i saw 3 guys on a bike halted few meters away from me. I was ready with the key as the moment they approach me i will start the bike and leave at the stretch was deserted. But those guys left before me. There was no problem. But one need to be careful when traveling alone. Sooner i reached kondala rao house he again kept water and everything ready for refreshing and the dinner was also ready. My two days of stay at his home literally made me to feel that i was at my home.